This promotion entitles new subscriber to one (1) Xiaomi Mi Band 2 upon successful sign up and activation of the broadband service. TIME reserves the right to and may refuse the provision of Fitness Tracker Promo to any customers who do not meet the applicable criteria. GEMFIVE (gemfive.com) is the fulfilment party for the Xiaomi Mi Band 2. Redemption of the Xiaomi Mi Band 2 must be done via www.gemfive.com/timepromo-miband2 following the instructions therein, and utilising the GEMCash code generated on TIME’s Self Care Portal (https://selfcare.time.com.my) after your Service has been activated. Once redeemed, the delivery status of the Xiaomi Mi Band 2 can be tracked through the GEMFIVE portal. Xiaomi Mi Band 2 only available in black. Redemption of the Xiaomi Mi Band 2 must be made by 28 February 2017. Any redemption after this date may be invalid. The Xiaomi Mi Band 2 comes with limited warranty coverage until 31 July 2017. Any claim for warranty must be submitted by this date to GEMFIVE. TIME disclaims all liabilities and responsibilities for such device warranty and the delivery and condition of the device. Any queries or complaints about the device, warranty claims, or order tracking requests shall be solely directed towards GEMFIVE. This promotion is only applicable to new registrations of TIME Fibre Business Internet Basic packages during the Promotion Period and existing subscribers of TIME Fibre Business Internet Basic who requests to opt in to the promotional monthly fee during the Promotion Period (collectively, “Eligible Subscribers”). The promotional monthly fees are not an automatic entitlement. Existing subscribers must request to opt in to the promotional monthly fee during the Promotion Period. An upgrade or downgrade is determined by changes in price, not speed. Existing subscribers who request to opt in to the promotional monthly fee, resulting in a downgrade, shall be liable to pay a downgrade penalty fee as determined by TIME if such request to downgrade is made prior to expiry of the 24-month contract period. A fresh 24-month contract period will be imposed on all existing subscribers who opt-in for the promotional monthly fee. This promotion entitles new subscriber to a one time RM100 rebate on first month bill based on the subscribed broadband package price only. This Promotion is only applicable during the applicable promotion period: 16 September 2016 – 18 September 2016 (inclusive) (“Promotion Period”). TIME may revise or extend the Promotion Period at any time without any prior notice. The Promotion is only applicable for subscribers whose Service has been successfully activated prior to the Promotional Period or during the Promotion Period. For the duration of the Promotion Period, all eligible subscribers are entitled to a total of 100 free minutes for Domestic, Mobile and IDD calls to 60 countries worldwide (click here for the full listing). 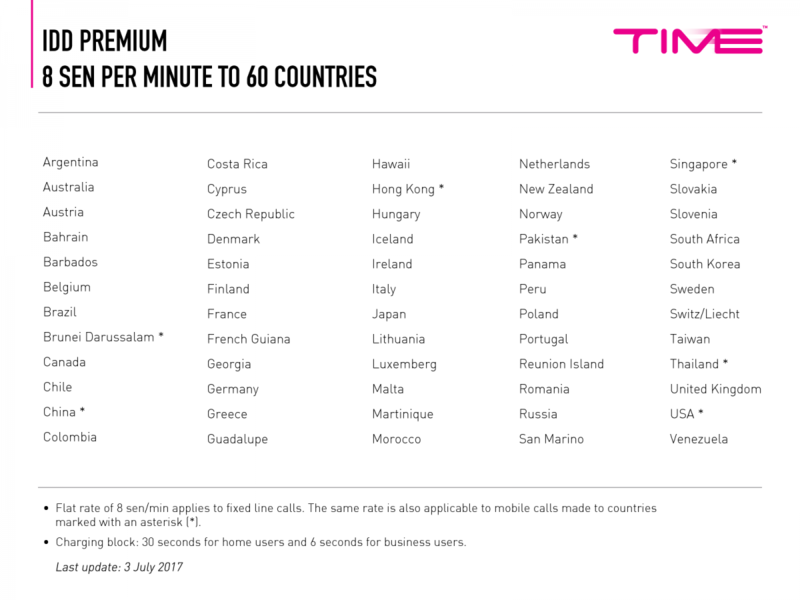 The free minutes may be used by the subscribers as necessary and interchanged between Domestic, Mobile and IDD calls (to the applicable 60 countries), up to a collective maximum of 100 minutes. Any unutilised balance at the end of the Promotion Period will not be refunded. Voice calls exceeding the 100 free minutes shall be charged at the applicable rate or deducted from the subscribers’ voice plan, as the case may be. TIME reserves the right to and may refuse the provision of any benefits under this Promotion to any customers at its sole discretion. This Promotion is valid only for customers who sign up for the Service via TIME’s online portal from 1 September 2016 to 30 September 2016 ("Promotion Period”) and whose Service is subsequently successfully activated (in accordance with Paragraph 5 below). This Promotion is only applicable for new registrations. Customers who subscribe for the Service through TIME’s dealers/agents during the Promotion Period shall NOT be eligible for the Promotion. TIME reserves the right based on its sole discretion to refuse the provision of the free GEMFIVE RM100 e-Vouchers to any customers who do not meet the Promotion criteria. GEMFIVE RM100 e-Voucher can be redeemed via portal http://www.gemfive.com/ or its apps GEMFIVE; available on Android Play Store and Apple App Store. GEMFIVE RM100 e-Voucher can only be redeemed once. Any unutilized balance will not be refunded. The e-Voucher must be redeemed before 31 December 2016. Any purchase of more than RM100 needs to be topped up by customer. Early termination of the service will be charged RM100 for the GEMFIVE e-Voucher on top of the existing RM500 early termination penalty. Customers of successful subscriptions will only be entitled to the e-Vouchers after successful service activation (successful service activation means successful installation and activation of the Service). For the avoidance of doubt, successful service activation may occur after the Promotion Period but shall not affect the customer’s entitlement to the e-Vouchers subject to the fulfillment of the required criteria under these Terms and Conditions. The e-Vouchers will be made available for download on the TIME Self Care Portal after the eligible customer’s successful service activation. The customer must possess a valid login ID in order to access the TIME Self Care Portal. The customer will receive a welcome email containing the initial login details to the TIME Self Care Portal after successful activation of the customer’s subscribed Service. The e-Vouchers are non-refundable and cannot be exchanged for cash. TIME reserves the right in its sole discretion to substitute the e-Vouchers with alternative reward(s) of the same value. TIME reserves the right to disqualify you from this Promotion and/or to forfeit any e-Vouchers you may be entitled to if TIME believes, in its sole and absolute discretion, you have undertaken fraudulent or unfair practices and/or activities or other activities harmful to this Promotion or the Service subscription process. Fraudulent activities are deemed to include, but is not limited to any act of deceit and/or deception and/or cheating. TIME and its parent company, subsidiaries, affiliates, officers, directors, employees, agents, suppliers and/or subcontractors provide the Promotion and the TIME Self Care Portal on an “as is” basis and without any warranty or condition, whether express or implied. TIME and its parent company, subsidiaries, affiliates, officers, directors, employees, agents, suppliers and/or subcontractors specifically disclaim the implied warranties of title, merchantability, performance, fitness for a particular purpose, satisfactory quality or non-infringement of any third party’s intellectual property or proprietary rights. In addition, no advice or information obtained (whether orally or written) by the customer from TIME shall create any warranty and the customer may not rely on any such statement of warranty. The customer shall assume full liability and responsibility in the event of any liability, mishap, injury, loss, damage, claim or accident resulting from the customer’s participation in this Promotion, redemption and/or usage of the e-Vouchers. All other terms and conditions governing the use of the Services shall apply herein mutatis mutandis. This Promotion is only applicable during the applicable promotion period: 8 August 2016 – 31 August 2016 (inclusive) (“Promotion Period”). TIME may revise or extend the Promotion Period at any time without any prior notice. one (1) GEMFIVE e-voucher worth RM100 ("e-Voucher"). Eligibility. The Online Subscription Promotion is only applicable for new subscribers who sign up for the Service via TIME’s online subscription portal during the Promotion Period and whose Service is subsequently successfully activated in accordance with Paragraph 5 below. This Dealer Promotion entitles new subscribers to RM100 off on the first month’s bill based on the subscribed Service package price only. Eligibility. The Dealer Promotion applies to subscribers who subscribe for the Service through TIME’s dealers/agents during the Promotion Period. The Promotion is not to be combined with other special offers, discounts or promotions offered by TIME and/or TIME’s dealers/ agents. Subscribers of TIME Fibre Home Broadband via Astro IPTV are NOT eligible for the Promotion. Each e-Voucher shall be valid until 31 December 2016. Each e-Voucher can be redeemed via GEMFIVE’s online portal at http://www.gemfive.com/ or the GEMFIVE mobile applications available on Android Play Store and Apple App Store. Each e-Voucher can only be redeemed once. Any unutilised balance will not be refunded. Customers shall be required to pay the balance for purchases exceeding the value of the e-Voucher. Use of the e-Voucher and shall be governed by any terms and conditions imposed by GEMFIVE found at http://www.gemfive.com/my/store-promotion-code/. Customers of successful subscriptions will only be entitled to the e-Voucher after successful service activation (successful service activation means successful installation and activation of the Service). For the avoidance of doubt, successful service activation may occur after the Promotion Period but shall not affect the customer’s entitlement to the e-Vouchers subject to the fulfillment of the required criteria under these Terms and Conditions. The e-Voucher will be made available for download on the TIME Self Care Portal after the eligible subscriber’s successful service activation. The subscriber must possess a valid login ID in order to access the TIME Self Care Portal. The subscriber will receive a welcome email containing the initial login details to the TIME Self Care Portal after successful activation of the subscriber’s Service. The e-Voucher is non-refundable and cannot be exchanged for cash. TIME reserves the right in its sole discretion to substitute the e-Voucher with alternative reward(s) of the same value. TIME reserves the right to and may refuse the provision of any benefits under this Promotion to any subscribers who do not meet the applicable criteria. TIME reserves the right to disqualify you from this Promotion and/or to forfeit any e-Voucher you may be entitled to if TIME believes, in its sole and absolute discretion, you have undertaken fraudulent or unfair practices and/or activities or other activities harmful to this Promotion or the Service subscription process. Fraudulent activities are deemed to include, but is not limited to any act of deceit and/or deception and/or cheating. Early termination of the Service (i.e. termination prior to the expiry of the Minimum Contract Period) will be charged a penalty of RM100 for the e-Voucher in addition to the prevailing early termination penalty. Online Subscription Promotion: 21 June 2016 – 7 August 2016 (inclusive). Dealer Promotion: 1 July 2016 – 7 August 2016 (inclusive). TIME may revise or extend each respective Promotion Period at any time without any prior notice. Eligibility. The Online Subscription Promotion is only applicable for new subscribers who sign up for the Service via TIME’s online subscription portal during the Promotion Period and whose Service is subsequently successfully activated (in accordance with Paragraph 5 below. This Dealer Promotion entitles new subscribers to a free one (1) month fee based on the subscribed Service package price only. For the avoidance of doubt, all other charges (e.g. charges for pay-as-you-use voice calls, voice plan, etc.) shall remain payable during the free 1 month period. Contract of 24 months shall start from the activation date inclusive of the free 1 month period. This promotion entitles new subscriber to a free 1 month fee based on the subscribed broadband package price only. For the avoidance of doubt, all other charges (e.g. charges for pay-as-you-use voice calls, voice plan and The Star ePaper Subscription) shall remain payable during the free 1 month period. Contract of 24 months shall start from the activation date inclusive of the free 1 month period. TIME reserves the right to and may refuse the provision of One Month Free Subscription to any customers who do not meet the applicable criteria. Sky Park One City (Jalan USJ 25/1, 47650 Subang Jaya, Selangor Darul Ehsan). This Programme entitles Facebook users who have “Liked” the TIME Facebook Page to redeem certain complimentary rewards (“Reward(s)”) at the participating cafés during the Programme Period. This Programme is only applicable during the Programme Period at specified participating cafés, details of which (i.e. café name, location and Reward(s)) shall be stated in their respective Promotional Banner. a. Facebook users must first “Like” the TIME Facebook Page. b. The Promotional Banner may be found on the TIME Facebook Page. c. The Facebook user must show the Promotional Banner along with confirmation that the Facebook user has “Liked” the TIME Facebook Page, from the screen of the user’s mobile device at the participating café to redeem the Reward(s). Each participating café shall offer a limited number of Reward(s), over the course of each Programme Period. Redemption of Reward(s) will be available only while stocks last. The Promotional Banner is valid for one (1) Reward(s) redemption per Facebook user over the course of each Programme Period at a participating café and is not exchangeable for cash. The participating cafés have the sole discretion of allowing upgrades or exchanges (whether chargeable or otherwise) of food & beverage utilising the Promotional Banner. This Programme is provided on an “as is” basis and neither TIME nor its officers, directors, employees, agents, suppliers and/or subcontractors provide any warranty or condition, whether express or implied, any implied warranties of title, merchantability, performance, fitness for a particular purpose, satisfactory quality or non-infringement of any third party’s intellectual property or proprietary rights. In addition, no advice or information obtained (whether orally or written) by the subscriber from TIME shall create any warranty. TIME excludes and you shall assume full liability and responsibility in the event of any liability, mishap, injury, loss, damage, claim or accident resulting from your participation in this Programme and/or redemption of the Reward(s). TIME reserves the absolute right at any time without prior notification and without assigning any reasons thereto to cancel, terminate, postpone or suspend indefinitely the Programme. TIME reserves the right to revise, amend, or modify these Terms and Conditions and you shall be bound by such revision, amendment, and/or modification. This Reward shall be valid for a period of seven (7) days, from 25 December 2015 to 31 December 2015 ("Reward Duration”). TIME reserves the right to amend the Reward Duration at any time without any prior notice. This Reward is valid only for TIME Fibre Home Broadband subscribers whose Service has been successfully activated by 29 December 2015. Successful activation means successful installation and activation of the Service. During the Reward Duration, all eligible subscribers will be automatically provided with 100Mbps unlimited connection (“Service Benefit”), subject to TIME’s Fair Usage Policy and Ethical Service Usage Policy. No further action will be required from eligible subscribers to receive the Service Benefit. Should the subscriber’s Service be successfully activated during the Reward Duration but by 29 December 2015, the subscriber will enjoy the Service Benefit on the following day AFTER the subscriber’s Service activation (i.e. the subscriber’s broadband speed shall be as per the original Service package and not 100Mbps until one day after successful activation) and only for the remaining time of the Reward Duration (i.e. until 31 December 2015). Utilisation and purchase of boost and/or quota via the TIME Selfcare Portal will be suspended during the Reward Duration. The Service is provided on a best effort basis and subject to equipment capability to reach the full speed of 100Mbps. The Service is best experienced over a cable connection. Wireless connections (i.e. WiFi) may not be able to provide subscribers with the intended speed because of various factors including end device capability and the environment. Subscribers of TIME Fibre Home Broadband via Astro IPTV and TIME Fibre Business Internet are NOT eligible to receive the Reward / Service Benefit. TIME reserves the right based on its sole discretion to refuse the provision of the Service Benefit to any subscribers. TIME reserves the right to modify, suspend or cancel this Reward for any reason whatsoever, including but not limited to (i) the Reward becoming incapable of being run as planned; or (ii) TIME’s network is subject to technical interference or corruption, including but not limited to any infection caused by computer viruses, bugs, tampering, unauthorized intervention, fraud, technical failures, or any other causes beyond the control of TIME. The use of the Service is always subject to TIME’s Fair Usage Policy and Ethical Service Usage Policy. You are advised to adhere to the policies which can be found at http://www.time.com.my/policy_fair and http://www1.time.com.my/fair-usage-policy#ethical-policy. Failure to do so may result in the termination of your Service or the immediate revocation of the Service Benefit. TIME and its officers, directors, employees, agents, suppliers and/or subcontractors provide the Reward, Service and/or the Service Benefits on an “as is” basis and without any warranty or condition, whether express or implied. TIME and its officers, directors, employees, agents, suppliers and/or subcontractors specifically disclaim the implied warranties of title, merchantability, performance, fitness for a particular purpose, satisfactory quality or non-infringement of any third party’s intellectual property or proprietary rights. In addition, no advice or information obtained (whether orally or written) by the subscriber from TIME shall create any warranty. This Promotion is valid only for the first 300 customers who sign up for the Service via TIME’s online portal from 25 November 2015 to 15 January 2016 ("Promotion Period") and whose Service is subsequently successfully activated (in accordance with Paragraph 5 below). This Promotion is only applicable for new registrations and strictly available to customers who subscribe for a Service package for a period of twenty four (24) months. TIME reserves the right based on its sole discretion to refuse the provision of the free IMAX® Premium Seat tickets to any customers who do not meet the Promotion criteria. Only four (4) IMAX® Premium Seat tickets will be provided for each Service activation per customer and shall be provided by way of e-vouchers which are redeemable directly from TGV Cinemas ("e-Vouchers"). Each e-Voucher shall be valid until 31 May 2016 and shall be governed by the terms and conditions stated thereon and these Terms and Conditions. Customers are required to print out the e-Vouchers and present the e-Vouchers directly at the relevant TGV Cinemas ticketing counter for redemption. The e-Vouchers are not valid for online redemption and valid for redemption within validity date stated on the voucher. Each e-Voucher is only valid for one (1) time use and will each have a unique identifier code. Do note that the movie tickets are available on a first-come first-serve basis. Cash Top-Up needed for Twin Seats (must provide 2 vouchers for Twin Seats) and selected Movies (when specified). TIME and its parent company, subsidiaries, affiliates, officers, directors, employees, agents, suppliers and/or subcontractors provide the Promotion and the TIME Self Care Portal on an "as is" basis and without any warranty or condition, whether express or implied. TIME and its parent company, subsidiaries, affiliates, officers, directors, employees, agents, suppliers and/or subcontractors specifically disclaim the implied warranties of title, merchantability, performance, fitness for a particular purpose, satisfactory quality or non-infringement of any third party’s intellectual property or proprietary rights. In addition, no advice or information obtained (whether orally or written) by the customer from TIME shall create any warranty and the customer may not rely on any such statement of warranty. These Terms and Conditions shall be read together with the existing terms and conditions for the Service (as set out in http://time.com.my/terms-and-conditions). In the event of conflict between the two, these Terms and Conditions shall prevail. This promotion is only applicable for new registration and strictly available to selected customers who sign up for the Service package within the specific promotion allocation (as set out at www.time.com.my/TIMEInternetPromo). This promotion is valid from 5 May 2015 to 18 May 2015 or while stocks last ("Promotion Period"). TIME reserves the right based on its sole discretion to refuse the provision of free hard disk to any customers who do not meet the promo criteria. Only one (1) free hard disk will be provided for each subscription and shall be subject to stocks availability. If any of the information you have submitted is inconsistent with the credentials provided or there are mistakes to such information provided, then you are obliged to remove such inconsistency or rectify the mistakes. Pending the removal of such inconsistency or rectifications, you are not entitled to receive the free hard disk and TIME is not obliged to provide the free hard disk to you. If such inconsistency is removed or the mistake(s) is rectified within the Promotion Period, then TIME will provide you with the free hard disk but this shall be subject to stocks availability. TIME will provide the customers with successful applications with the free hard disk within 30 working days after the successful activation of the Service. Upon the date of your receipt of the said hard disk from TIME (" Date of Receipt"), all legal and beneficial ownerships of the said hard disk shall be passed to you and TIME shall not be liable for any malfunction and/or damage to the said hard disk after the Date of Receipt. You are not allowed to choose the colour and model of hard disk. Subject always to availability of stocks, TIME may, at its sole discretion, deliver another hard disk of similar value to you. All hard disks come with a three (3) year warranty from the manufacturer of the said hard disk which shall be effective from the Date of Receipt ("Warranty Period"). You shall adhere to manufacturer's requirement to activate the Warranty Period as specified in the manufacturer's warranty document. You shall liaise directly with the manufacturer of the hard disk on matters pertaining to Warranty Period, malfunctioning of the hard disk or damage thereto. TIME disclaims all liabilities and responsibilities for such warranties as TIME is merely a party providing the free hard disk as a gift to you. If you decide to terminate your Service before the expiry of the minimum contract period of the said Service, you shall then be liable to pay TIME (a) RM 300.00 for the hard disk provided and (b) all charges (including any outstanding charges prior to termination) for the remaining period of your subscription as per the terms and conditions of the Service's subscription, which are available athttp://time.com.my/terms-and-conditions. We reserve the right to revise, amend, or modify these Terms and Conditions and you shall be bound by such revision, amend ment, and/or modification. Continued access and use of the Service shall deem to be your acceptance to the changes and updates to these Terms and Conditions. You are advised to adhere to TIME's Usage Policies which can be found at http://www.time.com.my/fair-usage-policy, failure to do so may result in your subscription being terminated.